Sustainable packaging is no longer a trend but an expectation of consumers. Increasing consumer pressure, instigated by what is now known as the Attenborough effect, changed the public mood and is forcing brands and retailers to rethink the sustainability of their product’s packaging. David Attenborough highlighted the devastating consequences of plastic in our oceans in last years BBC Blue Planets second installment. The world is starting to wake up and sustainable packaging can be the only way forward. Brands are responding to this change in the public mood and numerous brands, including McDonald’s, Iceland and Deliveroo, have made pledges to go plastic free or to use 100% sustainable packaging. Costa Coffee announced its new coffee cup recycling scheme in over 2,000 stores, committing to recycle any cup deposited by customers. 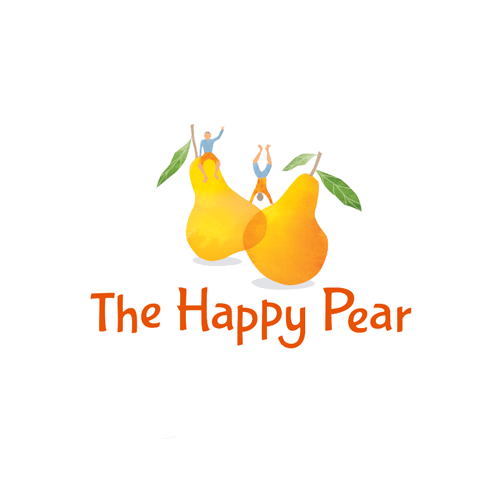 One of our own clients, The Happy Pear, a brand who has always had the reputation of being organic and eco-friendly was one of Ireland’s first business to use completely paper-free compostable cups. When it comes to making your product stand out, there is no doubt that packaging is important and must command a purchase-worthy first impression,. According to Bord Bia’s recent presentation ‘The Power of Packaging’, packaging plays a vital role in differentiating products, drawing attention from consumers, communicating brand values and driving loyalty. However, with this shift away from plastic, brands need to look for more sustainable solutions. We know packaging affects the entire supply chain, from the material producer to the converter, to the brand owner and retailer, to the waste and recycling organisations. And then back to the material supplier again. It is a delicate, complex loop. At Esmark Finch we have recently invested in Earth Pact Natural Material. Earth Pact Natural material is environmentally friendly paper made from agricultural waste. In order to feed 7 billion people worldwide, we grow more and more plants and crops. The food industry only uses a small portion of that: generally, only the seeds, fruits, roots, and juices. On average, only 20% of the plant is used for food and 80% are stems and leaves, agricultural waste! Worldwide, the majority of this agricultural waste is burned, which is a shame in a time where raw materials and the environment are becoming increasingly important. This material gives a second life to agricultural waste. In doing so, lowering ecological footprint, add value to waste, and prevent wastage. A more sustainable solution. No trees needed to be cut down for this material. Adding value to waste by transforming agricultural waste into raw material for paperboard. Quality isn’t sacrificed, producing a high quality board which can be recycled up to 7 times. After that, it can always be burned to generate energy or even better: by means of anaerobic digestion into biogas and compost, the end result is that we have made energy and manure out of waste. 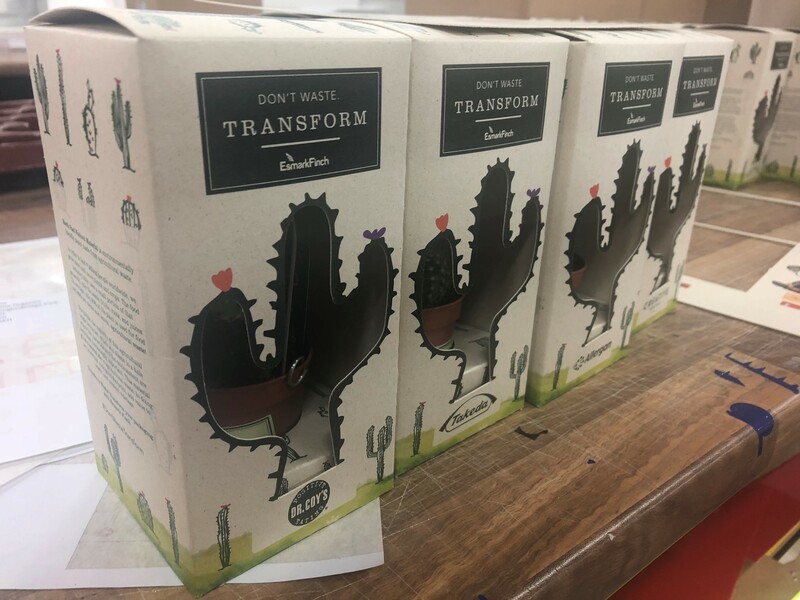 Our production team designed and produced a sample carton of this material to send out to some of our clients so they can see firsthand, the look and feel of this material and that quality doesn’t need to be sacrificed for sustainability. We also included a small cactus for their desk for them to ‘transform’ with the facial feature cut outs. The campaign fitted well with Halloween approaching and we received a great response for the campaign, with clients loving the packaging material. 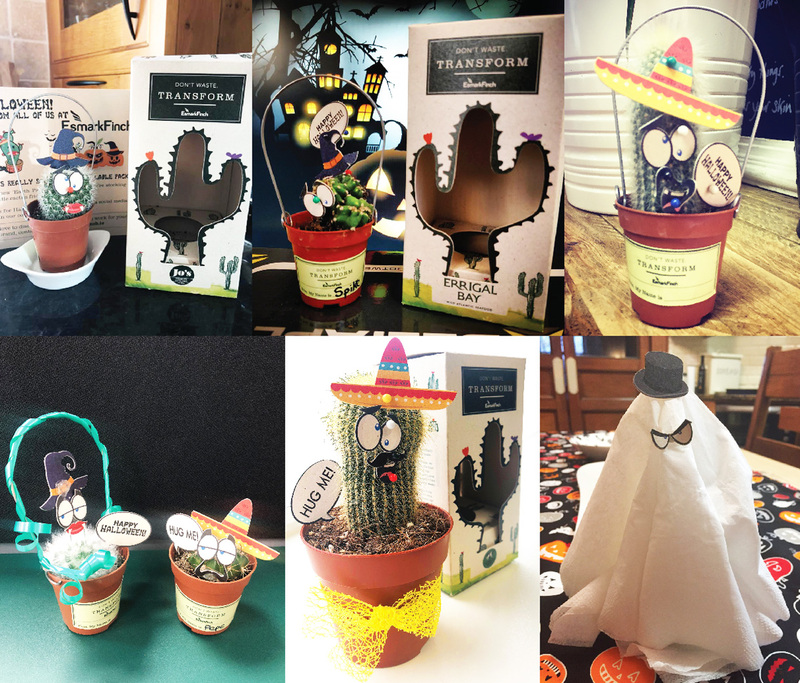 We received some amazing, creative cactus images on social media with just some of them below. We’d love to discuss this material further with you and how it can work for YOUR brand in your important steps towards sustainable packaging. Transform Waste! 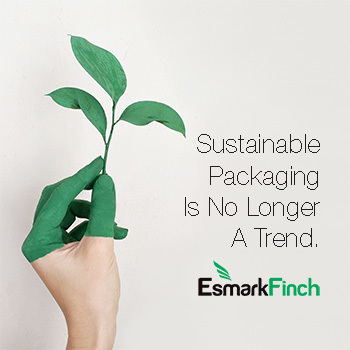 Transform your packaging with Esmark Finch.